Copyright © 2013 Hailin Liao et al. This is an open access article distributed under the Creative Commons Attribution License, which permits unrestricted use, distribution, and reproduction in any medium, provided the original work is properly cited. In this paper, the author reported the effect of maifanite on the learning and memory of rats suffering Cd poisoning by step-down and stepthrough test, analyzed the content of MDA, MT, SOD, and GSH-Px in the hippocampus of rats respectively, and assayed the content of Fe, Cu, Zn, Mn, Se, and Cd in the hippocampus of rats. In the step-down test, it is found that maifanite can reduce the number of electric shock, prolong step-down latency, and cut down error times when rats are exposed to Cd 24 h. In the stepthrough test, maifanite can obviously prolong the latency of entering the dark cabin of rats suffering Cd poisoning. The exogenous Cd can lead to the decrease of SOD and GSH-Px activity and the increase of MDA and MT content. The alternation of maifanite and Cd by the gavage can significantly increase the SOD and GSH-Px activity as well as MT content, while lessening the MDA content. The accumulation of exogenous Cd in hippocampus causes the increase of Zn, Fe, Mn, and Cd content, and the decrease of Cu and Se content. The intake of maifanite can regulate the imbalance of metals content and make its content near to the of level control group. The research shows that maifanite can improve the ability of learning and memory of rats suffering Cd poisoning, increase MT formation and lower hyperoxidative damage. Maifanite has the function of balancing the content of trace elements in rats suffering Cd poisoning, and meanwhile can alleviate the toxicity of Cd effectively. Cd is listed by the US Environmental Protection Agency as one of 126 priority pollutants. Soluble Cd salts can accumulate and has a long biological half-life of 17 to 30 years in humans, in which the toxity exerts an effect on the kidney, liver and central nervous system etc. . Its exposure is inevitable and may produce toxic effects in many organs and organ systems through binding to biological structures, accumulation in internal organs or induction of free radical production . Therefore, how to clear the Cd accumulation in the body is an urgent and important mission. Cd may contribute to the initiation and promotion of neurodegenerative diseases like Alzheimer’s disease or Parkinson’s disease, and its accumulation can lead to disturbance of metal homeostasis in the brain . Another important aspect of Cd toxicity is its interaction, often antagonistic, with essential elements. Vice versa, additional intake of the essential elements may have a beneficial influence on the distribution and toxic effects of Cd . Maifanite is a granitoid silicate and has been used in many fields for a long time in East Asia countries such as China and Japan, and has proved to have no toxicity. There are more than 50 elements in maifanite mineral [4,5]. Both the loose porosity structure and the very small size on the surface are caused as a result of the long-term weathering and denudation. Therefore, many mineral elements are produced after the primary maifanite mineral is immersed into water. The major elements in the aqueous extract of maifanite are K, Na, Ca, Mg, Zn, Cu, Fe, Mn, and Se etc. [4,5]. The animal experiments demonstrated that maifanite possesses an obvious pharmacological effect on anti-aging, anti-fatigue, anti-hypoxia and so on, which may be related to mineral elements in maifanite [5,6]. In our previous study, we found that maifanite could improve the learning and memory, and the antioxidant abilities of Alzheimer’s Disease rats. Maifanite had the potential prevention and treatment for Alzheimer’s Disease . In the present research, the authors study the effects of the aqueous extract of maifanite on learning and memory of rats suffering cadmium poisoning by step-down and step-through tests. The hippocampus is a major component of the brains of humans and other mammals, and it is also a component of the limbic system and plays a critical role in learning and memory etc. . Therefore, the hippocampal levels of superoxide dismutase (SOD), glutathione peroxidase (GSH-Px), malon dialdehyde (MDA) and metallothionein (MT) were assayed in order to research if maifanite can improve the antioxidant abilities of rats suffering Cd poisoning. For clarifying the content change of trace elements, the hippocampus levels of Fe, Cu, Zn, Mn, Se, and Cd were determined by ICP-AES technique. The maifanite was purchased from the Guifeng Maifanite Company in Guangxi Guiping City, China. The aqueous extract of maifanite was obtained as follows: 1) the 10 g of maifanite (100 no. mesh) was immersed into deionized water (100 ml) for 30 min at room temperature, and then it was refluxed at 80˚C for 60 min. It was filtered to prepare the aqueous extract of maifanite, represented by the MFhigh. 2) The MFhigh was diluted by ten times and 100 times, respectively, represented by the MFmiddle and MFlow. Using ICP-AES, the element concentration (μg/ml) of the MFhigh is determined, which is Fe 0.068, Cu 0.022, Mn 0.049, Zn 0.037, Se 0.015, and Al 0.001. The CdCl2 and other chemicals were of analytical reagent grade and obtained from Shanghai Chemical Reagent Corp. (China). The test kits of MDA, SOD, and GSH-Px were all purchased from Nanjing Jiancheng Bioengineering Institute (China). The kit of MT was provided by the Shanghai Jingma Biological Science & Technology Co., Ltd. (China). Fifty healthy male Sprague-Dawley rats, weighed 300 ± 10 g at the beginning of the experiments, were used, provided by Lab Animal Central of Guangxi Medical University. They were maintained under a 12/12-h lightdark cycle (light beginning at 8:00 a.m.) and in a controlled temperature (22 ± 2˚C), relative humidity of (60 ± 10) percentage. They had access to food and deionized water. Animals were given an adaptive phase of one week to the lab condition. The study was approved by the Ethics Committee of Guangxi University of Chinese Medicine. The rats were randomly divided into five groups. Each group consisted of ten animals, and each animal was used once: [A] control group: The 3 ml saline solution was given by oral gavage, once daily for 30 days; [B] CdCl2 group: The 3 ml saline solution first, and on the following day 10 μmol/kg CdCl2 was given by gavage alternately, each for 15 days; [C] CdCl2 + MFlow group: The 3 ml MFlow first, and on the following day 10 μmol/kg CdCl2 was given by gavage alternately, each for 15 days; [D] CdCl2 + MFmiddle group: The 3 ml MFmiddle first, and on the following day 10 μmol/kg CdCl2 was given by gavage alternately, each for 15 days; [E] CdCl2 + MFhigh group: The 3 ml MFhigh first, and on the following day 10 μmol/kg CdCl2 was given by gavage alternately, each for 15 days. After 30 days, behavior tests, including step-down test and step-through test, were carried. Step-down test: After 30 days, the rats were tested by a step-down test in a passive avoidance chamber. The floor of the chamber consists of copper rods and a well-insulated platform made of rubber in one corner of the chamber. The rats were placed in the chamber for a 3-min adaptation period and were then placed on the platform. Their latency to step down on the grid with all four paws was measured. Upon stepping down on the copper bars, the rats received an immediate mild electrical shock (36 V). To avoid the shock, rats demonstrated an instinctive reaction to jump back onto the platform. Rats were tested in this manner for 5 min. The number of times rats stepped down from the platform within 5 min was considered acquisition errors. After 24 h, this procedure was repeated, and the step-down latency was used as a measurement of memory retention. The number of times the rats stepped down onto the platform within the 3-min interval was recorded as retention errors. Step-through test: a step-through-type passive avoidance test was carried out to evaluate the effect of maifanite on learning and memory. The shuttle box (60 × 50 × 80 cm) consisted of two compartments of equal size (20 × 12 × 60 cm). Each compartment was divided into a light and a dark chamber by a guillotine door (3 × 4 cm). The light chamber was equipped with an illuminator. All the rats were habituated to the light and dark chamber three times for 3 min until they entered the dark compartment within 15 s (training trial). The rats that did not enter the dark compartment within 15 s after the three habituations would be rejected. The test consisted of acquisition and retention sessions carried out 24 and 48 h, respectively, after the training trial. For the acquisition trial, the rats were placed in the illuminated chamber opposite the guillotine door and allowed to move freely. When all four paws were on the grid floor of the dark compartment, a scrambled constant-current foot shock (constant voltage 50 V) was delivered to the grid. The number of times the rats stepped into the dark chamber, the time spent in the dark chamber, and latency to move into the dark chamber within 5 min were recorded automatically by computer. 24 h after the acquisition trial, the rats were again placed in the light chamber for the retention trial. If a mouse did not enter the dark chamber within 300 s, the latency was recorded as the cutoff time of 300 s. Rats were removed manually from the light chamber when the cutoff time was reached. After the behavioral tests, the rats were sacrificed, and brains were quickly removed, followed by dissection of the hippocampus on ice. In order to determine the level of MDA, MT, SOD, and GSH-Px the four random rats hippocampus was weighed and homogenized with a buffer consisting of 10 mM sucrose, 10 mM Tris-HCl, and 0.1 mM EDTA (pH 7.4) and then the homogenate was centrifuged at 3000 rpm for 10 min at 4˚C. The supernatant was used for bioassays. The contents of MDA and MT, and the activities of SOD and GSH-Px were assayed strictly according to the detection kit specification. The SOD activity MDA content was determined by hydroxylamine assay-developed from xanthine oxidase assay. The assay of GSH-Px activity and MDA content was determined by colorimetry. To transfer the hippocampus into liquid in order to measure metal elements concentration by the inductively coupled plasma-atomic emission spectroscopy (ICP-AES; IRIS Intrepid II XSP, USA Thermo Elemental), a microwave sample preparation system (MD6, Beijing Haotianhui trade Ltd. Corp.) was used. First, the hippocampus (1000 mg, wet weight) was mixed with 2 mL of 10% hydrogen nitrate and 1 ml of 30% hydrogen peroxide. They then were put into the microwave oven for wet digesting for about 1 h, after which we obtained the liquid. By ICP-AES, the elements Fe, Cu, Zn, Mn, Se, and Al in the hippocampus of rats were analyzed. The conditions were 1200 W from the radio-frequency generator, a plasma argon flow rate of 15 L/min, a cooling gas flow of 14 L/ min, a carrier gas flow of 1.0 L/min, a 20-μm entrance slit, a 30-μm exit slit, a height of observation of 15 mm, and an integration time lapse of 5 s.
All statistical analysis was performed using SPSS statistical software package version 13.0. Data were expressed as mean ± SD. One-way analysis of variance and LSD test were used for the tests between two or more groups. A p value less than 0.05 was considered to be statistically significant. Performance of the rats in the step-down test is shown in Table 1. 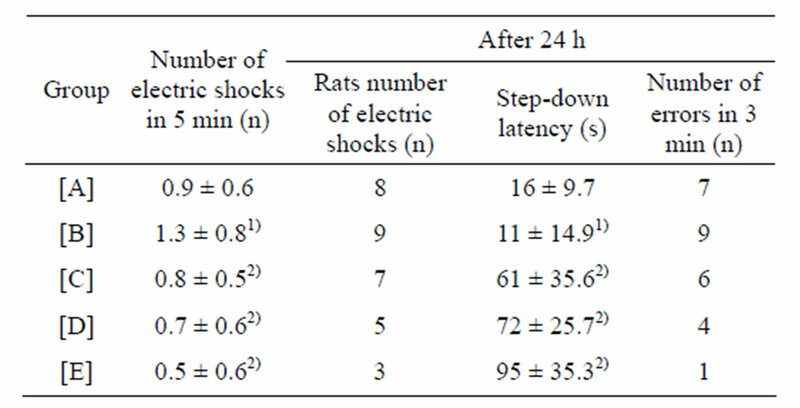 The number of electric shocks in 5 min increased (P less than 0.01), and the step-down latency shortened (P less than 0.01) 24 h later in CdCl2 group, as compared with control group. The shorter step-down latency and increased errors were reversed by increasing the concentrations of maifanite. The number of electric shocks in 5 min decreased (Pless than 0.05), the stepdown latency prolonged (P less than 0.05) 24 h later in CdCl2 + (MFhigh, MFmiddle and MFlow) group, as compared with CdCl2 group. The result of step-through test of the rats is shown in Table 2. 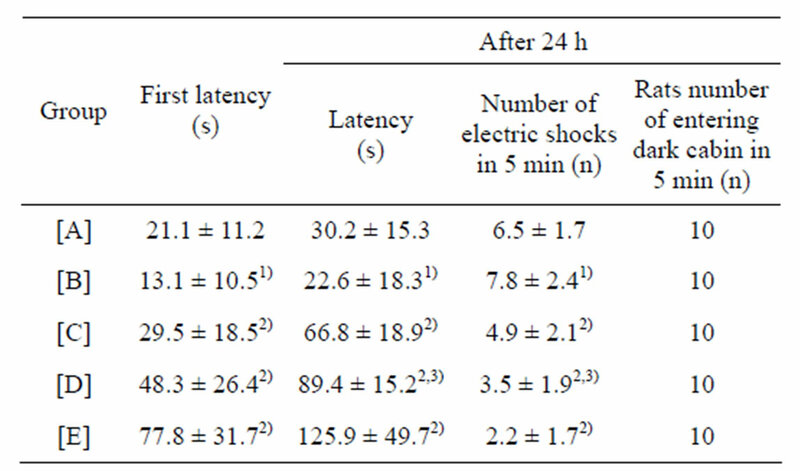 The first latency and the latency 24 h later shortened (P less than 0.01), the number of electric shocks in 5 min 24 h later increased (P less than 0.01) in CdCl2 group, as compared with control group. The shorter stepthrough latency and increased number of electric shocks were reversed by increasing the concentrations of maifanite. The first latency and the latency 24 h later prolonged (P less than 0.05), the number of electric shocks in 5 min 24 h later decreased (P less than 0.05) in CdCl2 + (MFhigh, MFmiddle, MFlow) group, as compared with CdCl2 group. Table 1. Results of step-down test (mean ± SD, n = 10). [A]: control group, [B]: CdCl2 group, [C]: CdCl2 + MFlow group, [D]: CdCl2 + MFmiddle group. [E]: CdCl2 + MFhigh group. 1)P less than 0.01, significantly different from the control group. 2)P less than 0.05, significantly different from the CdCl2 group. Table 2. Results of step-through test (mean ± SD, n = 10). [A]: control group, [B]: CdCl2 group, [C]: CdCl2 + MFlow group, [D]: CdCl2 + MFmiddle group. [E]: CdCl2 + MFhigh group. 1)P less than 0.01, significantly different from [A]. 2)P less than 0.05, significantly different from [B]. 3)P more than 0.05, no significant difference from [C]. There was no significant difference between CdCl2 + MFlow group and CdCl2 + MFmiddle group (P more than 0.05). The activities of SOD and GSH-Px decreased in CdCl2 group, as compared with control group, but the levels of MDA and MT increased (P less than 0.01). The activities of SOD and GSH-Px, the level of MT in CdCl2 + (MFhigh, MFmiddle, MFlow) group increased markedly compared with those of CdCl2 group, while the content of MDA decreased (P less than 0.05; Table 3). The hippocampus levels of Fe, Cu, Zn, Mn, Se, and Cd of different groups are shown in Table 4. The levels of Zn, Mn and Cd were higher (P less than 0.01) in CdCl2 group, CdCl2 + MFlow group, CdCl2 + MFmiddle group and CdCl2 + MFhigh group, as compared with control group. The levels of Fe, Cu and Se were lower (P less than 0.01) in CdCl2 group, CdCl2 + MFlow group, CdCl2 + MFmiddle group and CdCl2 + MFhigh group, as compared with control group. The imbalance levels of Fe, Cu, Zn, Mn, Se and Cd were regulated with the increase of concentrations of maifanite near to the level of the control group. The levels of Zn, Fe, Mn and Cd in CdCl2 + (MFhigh, MFmiddle, MFlow) maifanite group decreased markedly, as compared with CdCl2 group, meanwhile the level of Cu and Se were increased (P less than 0.05). Table 3. Activities of SOD and GSH-Px, Content of MDA and MT in hippocampus of rats (mean ± SD, n = 10). [A]: control group, [B]: CdCl2 group, [C]: CdCl2 + MFlow group, [D]:CdCl2 + MFmiddle group. [E]: CdCl2 + MFhigh group. 1)P less than 0.01, significantly different from [A]. 2)P less than 0.05, significantly different from [B]. Table 4. Results of elementary analysis in hippocampus of rats (mean ± SD, n = 10). CdCl2 group. Generally, the induction of MT to bind Cd is considered a protective response of cells to the presence of this toxic metal. The increase of MT is beneficial to eliminate the toxicity of Cd . The larger the level of MT is, the stronger the eliminating effect is. The results of ICP-AES show that microelements such as Fe, Zn, Mn, Se, and Cu play an important role in metabolic pathways affected by Cd. Cd accumulates mainly in liver and kidney of animals . The present research results showed that Cd could also accumulate in hippocampus. The Cd level increased more dramatically in CdCl2 group than that in control group. Compared to control group, the hippocampal levels of Fe, Se and Cu in CdCl2 group decreased, and those of Zn, Mn and Cd increased. The exogenous Cd perturbs the metabolism of Fe, Cu, Zn, Mn, Se and Cd. These changes may be the earliest manifestation of the toxicity of Cd. Cd can cause profound changes in those metals metabolism and homeostasis. One of the most intriguing findings in this study may be that maifanite can regulate the metals metabolism and homeostasis of rats suffering cadmium poisoning. Compared to CdCl2 group, the hippocampal levels of Fe, Se and Cu in CdCl2 + (MFhigh, MFmiddle, MFlow) group increased significantly, and those of Zn, Mn and Cd decreased significantly. The larger the concentration of maifanite is, the stronger the regulating effect is. The other most intriguing findings in this study may be that the Se level in high dose maifanite group is higher significantly than that in control group. It’s well known that Se is an essential microelement and a constituent of many selenoproteins with antioxidant properties that bind Cd . Therefore, those factors, such as size of maifanite, pH value, steeping time, steeping temperature, steeping solvent, heating time and heating temperature must be considered to orthogonal design when the optimum dissolved conditions were researched, in order to increase the dissolved content of Se. This may be one of the most important aspects to promote the eliminating effect on Cd toxicity of maifanite. Cd can accumulate in rats’ hippocampus, which results in the impairment of learning and memory, the decrease of SOD and GSH-Px activities, the increase of MDA and MT contents, the rise of Zn, Mn and Cd levels and the decline of Fe, Cu and Se levels. The alternation of maifanite and Cd by the gavage can lead to such results as improving the rats’ learning and memory abilities, increasing SOD and GSH-Px activities as well as MT content, decreasing MDA content, eliminating the accumulation of Cd effectively, increasing the level of Se and regulating the imbalance levels of Zn, Mn, Fe, Cu near to the control group level. Based on these studies, the following conclusions also can be obtained: maifanite can balance the content of trace elements in rats suffering cadmium poisoning and alleviate the toxicity of Cd effectively. The authors sincerely appreciate the financial support of Natural Science Foundation of Guangxi Zhuang Autonomous Region, China (No. 2011GXNSFA018056), and Natural Science Foundation of Guangxi University of Chinese Medicine, China (No. P2010014). Juan, L., Zhang, P.Y., Gao, Y., Song, X.G. and Dong, J.H. (2008) Overview of maifanshi: Its Physi-chemical properties and nutritious function in drinking water. Environmental Science & Technology, 31, 63-66. Zhang, B.G. (2005) The Progress of pharmaceutical research on maifanite. Chinese Traditional Patent Medicine, 27, 1205-1208. Liu, Z.Y., Liu, Q., Ma, J.K. and Zhang, C.W. (1986) Study on pharmacologic action of China maifanite. Jilin Journal of Traditional Chinese Medicine, 4, 28-30. Xu, S.Y., Bian, R.L. and Chen, X. (2002) Experimental protocols in pharmacology. 3rd Edition, People’s Medical Publishing House, Beijing, 826-830. Cousins, R.J. (1985) Absorption, transport, and hepatic metabolism of copper and zinc: Special reference to metallothionein and ceruloplasmin. Physiological Reviews, 65, 238-309. Klaassen, C.D. and Liu, J. (1998) Induction of metallothionein as an adaptive mechanism affecting the magnitude and progression of toxicological injury. Environmental Health Perspectives, 106, 297-300. Gemma, C., Vila, J., Bachstetter, A. and Bickford, P.C. (2007) Oxidative stress and the aging brain: From theory to prevention. In: Riddle, D.R., Ed., Brain Aging: Models, Methods, and Mechanisms. CRC Press, Boca Raton. *Conflict of interest: authors declare that there is no conflict of interest.